The Bison 120 has been specifically designed for operators for whom versatility, maneuverability and transportability are of key importance. It is small enough to fit inside a container for transport but strong enough to withstand the toughest of applications. 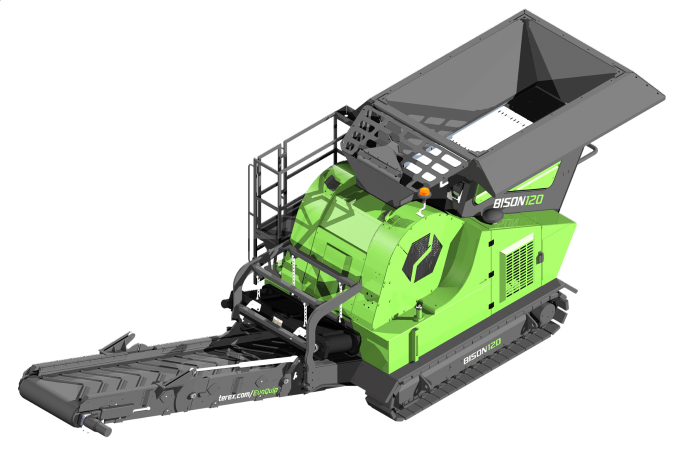 The Bison 120 features a ‘680mm x 400mm’ single toggle Jaw Crusher that can be adjusted hydraulically using the remote control which comes as standard with the machine. The Jaw is driven hydraulically allowing the customer the ability to reverse the Crusher to clear a blockage as well as being able to run in reverse permanently for sticky applications such as asphalt. The ability to adjust the jaw setting and operate the plant fully from the remote control allows for a fast and simple set up for the customer. With its intuitive operation, quick set-up times, compact size and ease of transport the Bison 120 the ideal solution for all small to medium sized operators. HOPPER / FEEDER: 2.3m3 (3yd3) Hopper capacity. Grizzly feeder as standard. 30mm (1-1/4") Nominal spacing grizzly. POWERUNIT: Tier 3: 61kW / 83Hp engine. Stage IIIB 52kW/70Hp Isuzu engine. Hydraulic drive of crusher. OUTPUT POTENTIAL: Up to 80tph / 90 US tph. CONVEYORS: 800mm (32") Wide product conveyor. GENERAL: Jaw level sensor as standard and remote control as standard. TRANSPORT: Track unit: L 5.58m (18'4") W 2.28m (7'6") H 2.74m (9').